Glorious colors produce clean, smooth, vibrant lines that blend just like traditional colored pencils. Just add water and a brush to create beautiful watercolor effects. The ergonomic triangular barrel contains a soft-grip zone for your drawing comfort. 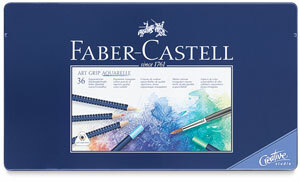 ® Faber-Castell is a registered trademark.® Art Grip is a registered trademark.